Can you believe it’s almost been 30 years since we last saw the adventures of Bill & Ted? Fast forward to today, and we have new news for the third film in the series. Bill & Ted Face the Music has been in the works for a while, but soon, fans will finally get to see the return of the two time-traveling metalhead slackers on the big screen. 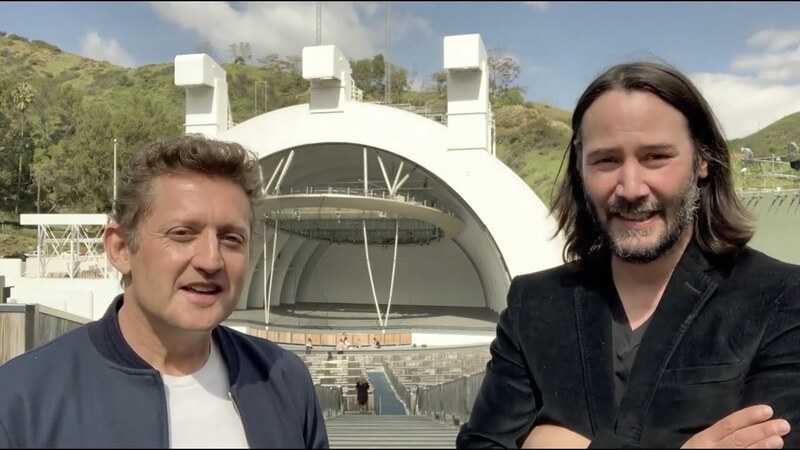 Alex Winter and Keanu Reeves came together at the Hollywood Bowl for a special announcement, revealing that the third film is going to go in production this summer with a release of Summer 2020. In the video announcement, the two actors channeled their inner Wyld Stallyns and went back and forth to thank the fans and announce the production and release year. Bill & Ted’s Excellent Adventure is the first film in the series that premiered 1989, following the duo as they time travel through history inside a telephone booth. To pass their high school history assignment, they enlisted the aid of Joan of Arc, Genghis Khan, Abraham Lincoln, Napoleon Bonaparte, Sacrotes, and Billy the Kid. If they fail, the future of the world will be doomed since Wyld Stallyns would never be formed. The sequel, Bill & Ted, gets even more absurd since the two are killed by their robot selves. They will literally travel to heaven and hell and will team up with aliens and the grim reaper to save their fiancées and perform in the Battle of the Bands. Synopsis: Yet to fulfill their rock ’n’ roll destiny, the now middle-aged best friends set out on a new adventure, when a visitor from the future warns them that only their song can save life as we know it and bring harmony to the universe. Along the way, they will be helped by their families, old friends and a few music legends. Bill & Ted Face the Music will be directed by Dean Parisot (Galaxy Quest, Red 2) from a script by Chris Matheson and Ed Solomon, who both wrote Bill & Ted’s Excellent Adventure and Bill & Ted’s Bogus Journey. Bill & Ted Face the Music hits theaters on August 21, 2020. But before the movie comes out, you can check out Keanu Reeves in the upcoming John Wick: Chapter 3 – Parabellum film, which hits theaters on May 17, 2019. Alex Winters has been busy with making documentaries. The post Bill & Ted Face the Music coming to theaters summer 2020 appeared first on Nerd Reactor.